September's Obsessions list is a few days late but hey, better late than never. Right? It was yet another busy weekend around here, as I had my in-laws visiting from out of town to celebrate the Munchkin's birthday (his birthday is actually today, but we made a weekend out of it)!! 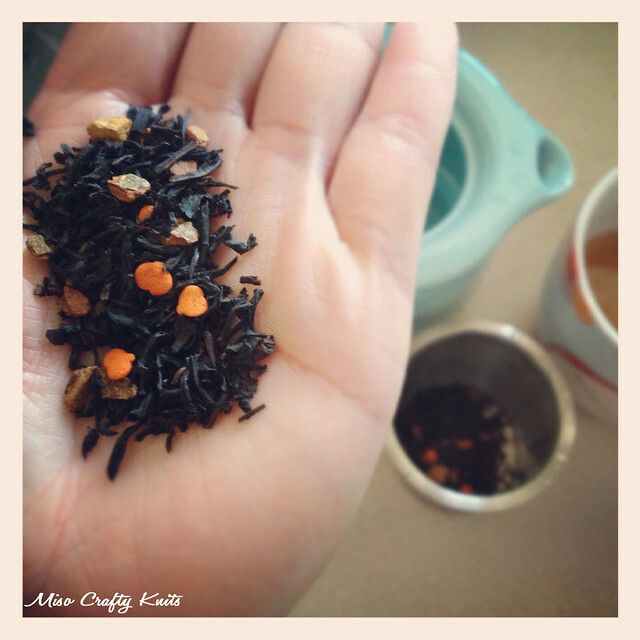 September in general was a pretty hectic month but was oh so quiet on the blog. I had knitting deadlines and goals to meet and therefore was knitting like my stash was on fire. Sadly these deadlines are for projects that I'm unable to share with you here on the blog at the moment. I've also been busy with the Munchkin - appointments, assessments, and helping him with all the mega changes that have been going on with our usual daily routine. I have to admit that the Munchkin isn't the only one needing help in dealing with these transitions. Realizing that your "baby" is growing up (way too fast I might add!) can be really hard on a parent! 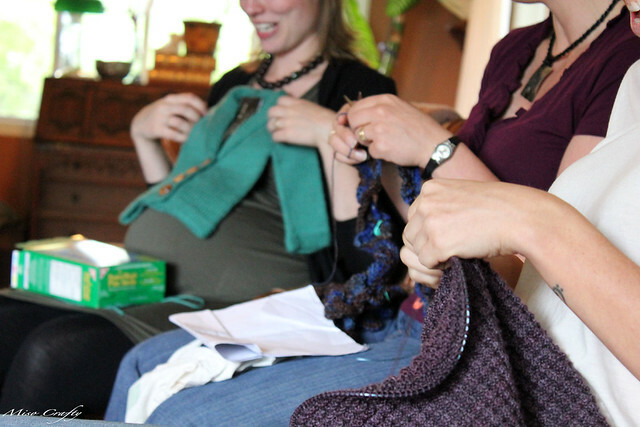 Ok, this was taken at a friend's knitterly baby shower, but I realized I didn't take any photos of my new friends! The past few months I've been super fortunate to be able to meet a few online friends and turned them into real life friends. It kind of blows my mind to get to know someone through the blogging world, Ravelry, Twitter, and even Instagram and when you finally meet them face to face it's like seeing an old friend. Last month I got to meet Liisa (hei hei Liisa!) of Sock-A-Plenty, who I never thought I would actually get to meet in person. Mainly because she lives all the way over in Finland. Liisa had stayed with me for almost a week and not once did we have an awkward silent moment (at least I didn't experience such a thing). I got to witness her lightning fast knitting (seriously, she knits so freakin' fast that it looks like she's doing nothing but shuffling stitches around! ), we talked and drooled over yarn, Liisa saw the stash, we chatted about knitting, and of course did some knitting together. The 4 days that she was here went by so fast that it was so sad to see her leave, even the Munchkin kept questioning where she went. At the beginning of the month I was fortunate enough to visit the SweetGeorgia Yarns studio at their new location when I went to Vancouver to meet up with Liisa. Would you believe that I actually had the willpower to hold back and only brought home 2 skeins of yarn? Ok, actually it was 8 skeins. But 1 of them wasn't mine, 2 was the sock yarn club yarn, and 3 were pre-ordered eons ago. But trust me, it was really, really, really hard to not go crazy. Especially when you see that hot pink wall (want!) 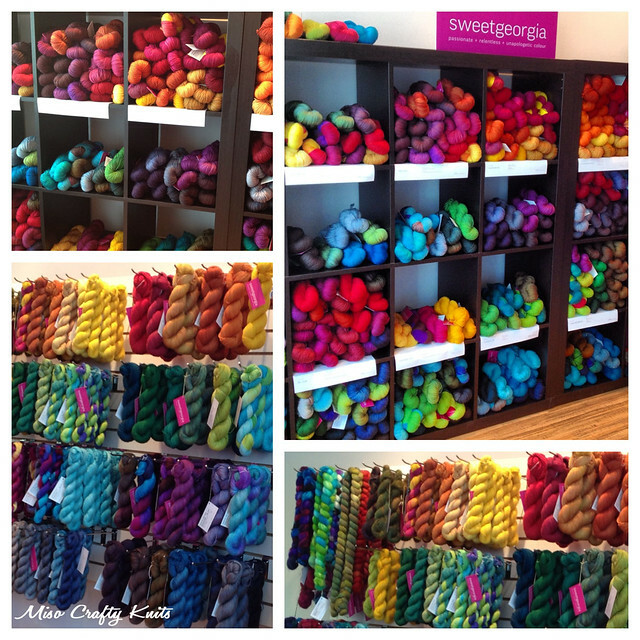 and come face to face with a feast of 2 walls full of bright and gorgeous yarn. Mmm...it was wonderful eye candy! Felicia was super nice and gave Liisa and I a tour of the studio and I drooled (again!) over the looms that she had. I'm kind of glad that I don't live in the lower mainland, or else I'd be stopping by the studio. A lot! I first discovered and learned about Long Winter Farm through Instagram, when a few people posted photos of their lip balm collection. 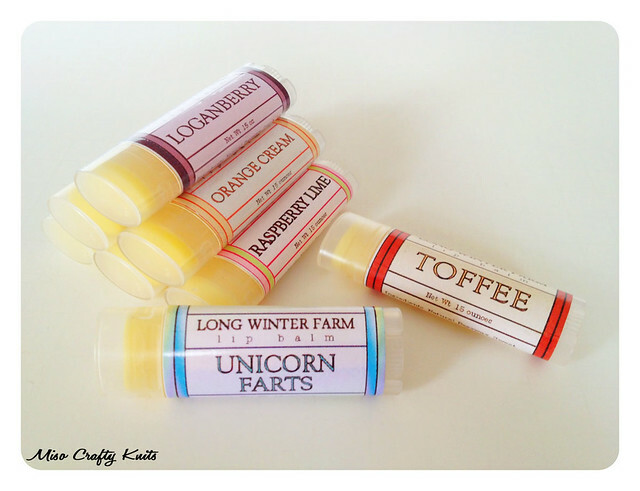 Long Winter Farm lip balm kept showing up and in particular, Unicorn Farts. The name alone made me want to get a tube. I mean, come on! One, who can resist the name? Two, who can resist spreading Unicorn Farts on their lips?? I love unicorns, don't you? Farts...well, not so much. But unicorn farts?? I think I could get into that. Then I found out that Unicorns Farts smell like cotton candy and spearmint. Yup. I was sold! I was totally content with just getting a solo tube of Unicorn Farts, that is, until I saw this photo. That photo made me go a little nuts when it came to ordering. And now I have a full-on addiction. Even though you don't really need to reapply this lip balm that often (cause it has some serious lasting power), I find myself constantly reaching for a tube. This stuff just feels so darn hootin' tootin' good, I can't help but to reapply often! I have a feeling that I'll be making another order really soon and that I'll be gifting these to everyone come Christmas! I used to be all about the zippered project bags simply because they seemed way more secure in keeping all my project stuff together, and were easy to knit out of. I had tried drawstring bags, but most of them were often the flat, baseless kind - which are super easy to sew up but not really ideal (for me at least) to knit out of. I've had numerous requests for drawstring bags and so I started to experiment and had sewn up a few samples. The drawstring bags that I've made have a much larger opening, padded square bottoms, and stand up perfectly on its own when all packed up and when in use. I've started folding down the top of the opening a little and they turn into a makeshift basket! Absolutely perfect to keep your ball of yarn in whilst you knit. Who needs a yarn bowl when your project bag can turn into one?? Another reason why I've converted into a drawstring project bag lover: it's much easier for me to stuff a small project in my handbag and when I'm waiting in a line-up somewhere or hanging out at a playground, it's mega easy to pull out your knitting and either keep the bag slightly open in your bag while you knit or simply hang the bag from your wrist and knit away. I've been playing around with different fusings and stabilizers (for anyone who knows me, finding the perfect fusing/stabilizer is absolutely key for me!) and think I've found the perfect combo. Yay!! So do you know what that means? It means that this month I'll be adding a few drawstring bags into the product line up in my etsy shop!! Not a fan of the drawstring project bag? 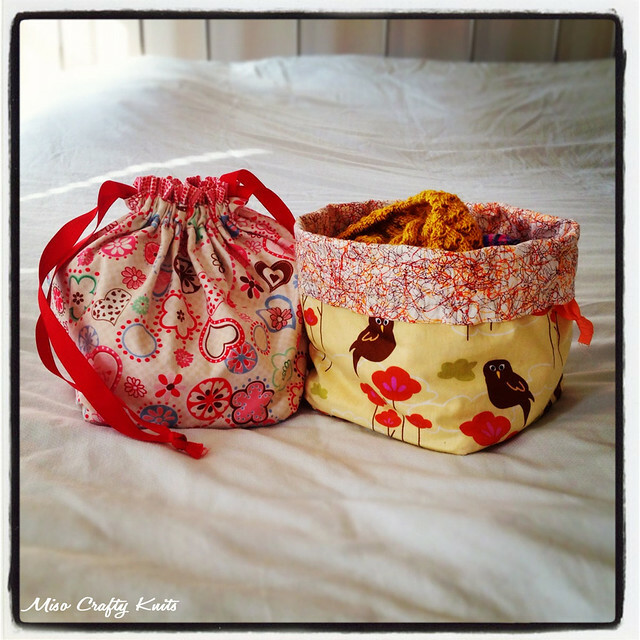 Don't worry, I'll still be sewing the zippered box bags! Gotta love the unicorn farts!! I swear I over use mine and yes I have put in another order to LWF, this time it included purfume oil!! Knit city here we come!!!! I SO want to try the perfume oil and the cream. I'm just patiently waiting for the Uni Farts and the Black Coconut to be listed in the shop again! Haha...thanks Leah! ♥ I hope I'll be able to list a couple by next week! and i totally 100% agree on every item on your list except the unicorn farts, because i haven't been lucky enough yet to witness such a thing in real life. just one more thing on the 2do list.. I'm going to David's tea tomorrow and I am sooo looking for Banana Nut Bread (kinda totally excited). Also all those lip balms...you are right one is just not enough! I really hope you like the Banana Nut Bread! I seriously drink cups upon cups of it in a sitting! And I don't feel bad about it since there's no caffeine in there!! How did you get all the flavors? When i went to the shop they said they won't ship flavors to Canada??? I'm sad :( I can get unicorn farts though so that's cool. ^^agreed! very odd, i sent the owner an email. Oops! Sorry for being late to the party...but I'm glad you got it figured out Judy! I can't wait for you to try out the Uni Farts too!